Simon's repsonse to my and others' anxieties about the Arctic Monkeys has certainly crystallized a few things. Perhaps unfairly, I can't help but read much of it symptomatically. It's hard not to attribute his lowered expectations - the palpable sense that 'this is the best we can expect now' - to the effects of a period of cultural downturn. Many of his arguments in favour of the Arctic Monkeys sound more like depressive rationalizations than wholehearted celebrations. I reiterate that my problem with the Arctic Monkeys is more with the 'phenonemon' than the record itself. It is the cultural politics of their success which trouble me. In Kantian terms, you could say the problem is not with the act (of liking the particular record) but with the maxim - the principle - underlying that act. One of those maxims is neatly stated in Simon's (presumably partly ironic) slogan “be reasonable, capitulate to the available”. The reason Pop was so attuned to the social tumult of the sixties and seventies was not because of any explicit 'political' content but because the axiom implicit in its enjoyment - 'Never be satisfied with the Possible!' - resolutely refused to come to a concordat with 'what was available'. What could be a better argument against the AM phenomenon than that it has led to a maxim such as this, which definitely places the enjoyment of Pop on the side of the reality principle and capitalist realism? While superficially convincing, this argument, quickly deconstructs itself. On what grounds can it condemn the supposed 'anti-modernism' of holding fast to modernist principles? Only by appealing to the very 'modernist' notion of progression and temporal succession which it at the same time rejects. But there is a deeper problem with this line of argument. It rests upon a fundamental misapprehension about the nature of modernism. Modernism is not an advocacy of the current or the contemporary. It would be better to say that it is the exact opposite of such a stance. Modernism is about breaks with current conditions. The modernist event is the moment when what appeared to be a seamless 'pre-sent' (Burroughs) breaks open; the Possible shatters into a million previously unimaginable possibilities. There is nothing determinate 'in' this moment; it is a kind of pure emptiness, a nihilation. Each modernist artifact is significant not for what it 'is' but for the possibilities it points to but which itself is not. To get concrete. Postpunk (and if anything remind us of this, it's Rip It Up and Start Again) was modernist not because it produced 'good records' but because it continually put into question the very notion of what a record is and what it could be. Each new band, or each new record by a band, each new style, posed that question differently and made new posings of the question possible. By contrast, the postmodernity to which the Arctic Monkeys belong is delimited-defined by a series of closed prescriptions. They belong to a stable genre which forms part of a resolved cultural scene in which the status of cultural objects like records is (ostensibly) settled. There can be endless repermutation within this cultural scene, but no events, nothing which breaks out of the parameters set by the scene. The analogy - or perhaps homology - here would be the 'interpassivity' of computer games: you can play the game in your own way, but the matrix of possible actions is already laid down. All you (can) do is select from a pre-set menu. The Arctic Monkeys no doubt combine the elements which make up their sound in an inventive, even ingenious way, but the elements are already givens, dehistoricised relics. That is why no amount of energy and effervescence will ever dispel the sense of defeat and staleness that their sound instantiates (youthful fizz will only make their undeath sound more uncanny*) and - at a meta-level - legislates. One might say that the record is about defeat and staleness; so it is, but, lacking the capacity to nihilate those conditions, it is reduced to merely expressing them. On the Dissensus AM thread, some have mocked vanguardism for its supposed interdiction that cultural products should only be enjoyed if they are 'aligned with a correct ideological program'. But this presupposes a separation of politics from culture, and forgets that the default condition for cultural products - especially in a period of Restoration like now - is to be 'aligned with an ideological program', namely, capitalist realism. The very positing of a non-political space is, in fact, the founding act of ideology, and 'entertainment' has constituted the pre-eminent example of such a space in postmodernity (the cultural expression of post-Fordist capitalism). A couple of posts back, Alex Williams described how changes in the market have led to the segmentation of the Pop audience into omnivorous consumers who 'graze' across well-defined niche genres. In the 'generic stability' of IPop and the passive nomadism of its consumers, then, we have 'capitalism in miniature', not because the IPop configuration is in some analogical relation to current capitalism, but because, more ominously, it is one of its structural effects. It might well be the case that this is to be the final fate of Pop, and that it will never again be the site for a modernist irruption. But we cannot a priori say that modernism is exhausted and finished. In the twenties and thirties, modernism's privileged sites were classical music, jazz, the novel, poetry and film. In the sixties and seventies, they were predominantly Pop and film. The period of retrenchment between these two great outbreaks was precisely that: not, as it might have appeared at the time, a final defeat for modernism, but a time of restoration and restitution. We live again in a period of Restoration, a period when it can seem that the crushing omnipresence of Global Capital has locked down cultural and political possibilities as never before. But the victory of Restoration would be complete if we forget that this is a time of lockdown and resign ourselves to acclimatizing to its privations. 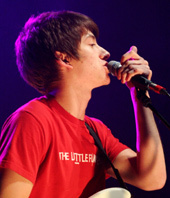 That is why the Arctic Monkeys are so dangerous a temptation. *It is uncanny I'll grant you that. The very fact that the AMs are so convincing - they actually could be New Wavers from 79 - is what makes them infinitely better than inept forgers like the leaden-footed Franz Ferdinand or dull clods like the Kaiser Chiefs. (btw Re: daft comparisons. I.P. compared Kaiser Chiefs, not the AMs, to the Ruts and the Members - entirely fairly, surely; and it wasn't me but Marcello, an AM admirer, who brought up Cud, Kingmaker and Wonderstuff.) They are uncanny because they resemble something that might have existed but never actually did, like a photograph airbrushed into history.